Whether embarking on a career teaching sailing or looking to teach your children to sail, this step by step guide will get the best out of you and your students. It takes the coach through the basics of teaching somebody to sail from their point of view and gives constant tips on how to help the student understand new ideas. 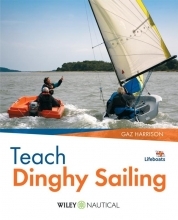 Part 1 How to Teach Dinghy Sailing. Lee shore launching and landing. 1.2 Teaching Sailing: First Steps. 1.6 Getting Ready to Go Afloat for the First Time. Responding to the helm`s instructions. 1.7. Preparing the Students to Take the Helm. First time on the helm. Tacking with centre main land drill. Tacking with aft main land drill. Preparing the boat for a land drill. Preparing the students for a land drill. Teaching tacking on the water. 1.9. Teaching Sailing to Windward. Time for the students to have a go. 1.10. The Five Essentials and Downwind Sailing. Land drill for teaching the gybe. Land drill for a centre-main gybe. Preparing the boat for the land drill gybe. Teaching the land drill gybe. Teaching the gybe on the water. 1.13. Teaching Sailing a Triangle. Teaching triangles on the water. Part 2 How to Teach from a Support Boat. 2.1. Teaching from a Support Boat. Key points that make a good session. 2.2. Your First Single-Handed Session for Beginners. 2.4. Going on to the Water. 2.5. What You Need in Your Support Boat. 2.7. Early in the Course. Towing from a support boat. Part 3 Advanced Sailing, Catamaran Sailing and Racing. 3.3. On the Water for the First Time in a Fast Boat. 3.4. Coaching from a Moving Support Boat.